Lexington was tasked with a difficult challenge Friday night, trying to find a way to slow down an explosive Lafayette County offense that had scored 40-plus points in all seven games this season. Turns out, the best strategy for the Minutemen was to keep the Husker offense off the field and on the sideline. The Lexington offense used a dominating rushing attack to milk the clock as much as possible on its way to an impressive 34-14 win over the third-ranked Huskers on their home field. It was mission accomplished on this night. Warren Sheppard spearheaded the rushing attack with 200-plus yards, while Cooper Lynn and quarterback Reese Gassen also lent a hand. Making it all possible was a dominating effort by the offensive line. After falling behind 14-7 late in the first quarter, the Minutemen began to take control on both sides of the ball. An interception by Lexington’s Blake Johnson set up the game-tying score, a 3-yard run by Sheppard. 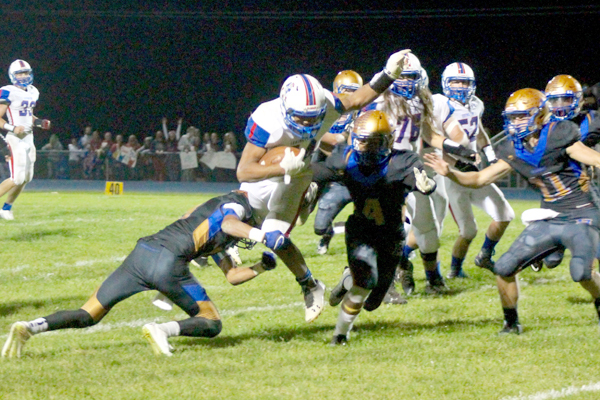 The Minutemen didn’t make things easy on themselves that drive as they put the ball on the ground twice, recovering both, and a pair of penalties put them in a second-and-29 situation. But a short pass and two long runs by Sheppard, including one on fourth-and-8, got them out of the hole and into the end zone five plays later to make it 14-all. The drive took up nearly half the quarter at 5 minutes, 31 seconds. Just before the half Lexington put together a quick scoring drive to take the lead. Sheppard had a 27-yard gain on the drive, and Gassen had a nice pass over the middle to McCrary to set up a 2-yard score for Sheppard with 22 seconds left to make it 21-14. The Lexington offense kept rolling right out of halftime, scoring on a nine-play drive - all runs - when Sheppard scampered into the end zone from 22 yards out on a fourth-and-1 for a 28-14 lead. Meanwhile, the defense was in shutdown mode. After allowing the score to put Lafayette County ahead 14-7, Lexington’s defense was all over the field. For the rest of the game, they had three interceptions, forced four three-and-outs and allowed only three first downs. The Huskers also lost quarterback Kinser Madison in the second half. Sheppard chalked a lot of the defensive success up to the last few weeks of practice. The Minutemen did a good job for the most part of keeping the Huskers’ athletes from getting to the next level and keeping them contained. "We were gap sound. We swarmed to the ball,” Barkley said of his top-ranked defense. "We had to keep everything inside. The outside linebackers did a nice job. They have great speed and if they get outside they’re tough to handle." Lexington put the finishing touches on the win late in the third quarter. After forcing another three-and-out, Lynn finished off a 56-yard drive with a 2-yard score. The Huskers, which saw their 43-game regular season win streak snapped, fall to 7-1 on the year and will host Carrollton next Friday to finish off the regular season. Lexington, No. 10 in the state in Class 2, moved to 8-0 and will travel to Richmond in hopes of a perfect regular season. "I hope we understand there is still work to be done,” Barkley said. "Our schedule has our toughest games at the end. But they’re a level-headed bunch. They’re self-motivated. They know what it takes to win."